To install the water level logger you do not need any special knowledge and skills, completely inexperienced user can handle it without any problem. You just have to follow the instruction and remember some general things to do before you start your monitoring. Do not forget to offload the information from the measuring instrument regularly. Different models can have specific aspects of installation, but in general, they operate on the same principles. You need to know the depth of water in your reservoir as it influences the choice of a type of logger, which is better to use. When you know the depth of the well and depth of the water, measure the stainless steel cable at the required length and connect it to the logger. It is better to put the level logger into the plastic tube or some sleeve to protect it from damage. It is also recommended to place the measuring device vertically, though it is not strict as is not always possible, for example when examining the level of water in the natural water bodies. Make sure that the level logger is deep enough to stay under the water all the time. In the same time, you need to remember, that it should not be deeper than it is set in characteristics. The pressure sensor can be damaged if over pressurized. Different types of operation and installation. 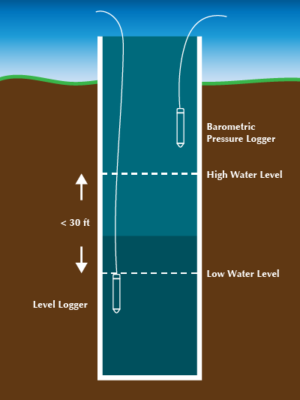 If the water level logger goes with the barometric logger or integral sensor of atmosphere pressure, you need to put it together with the level logger into the well, but only about a meter deep so that it hangs above the surface of water. The whole construction should be fixed on the pump hanger firmly, then you can close the well. The vented models do not need the barometer logger or sensor, and the difference in installation is that they go with the vented tube, which goes out of the water. This way, when the logger is free suspended, is commonly used in wells, but if there is some risk that the hanging device can be damaged by hitting the walls or other dangerous factors, you can fix it firmly with the help of metal straps or clamps. If you are monitoring the level of groundwater, some manufacturers recommend to chlorinate the well to avoid the contamination after you deploy the logger. You can add the bleach solution to it, but it is better to consult with the local authorities and find out how to do it correctly.